Apologies for the radio silence of late – post-walk (which was brilliant) I was then in Snowdonia on a school trip, surfing in Cornwall on another and generally being very busy with both work and rowing-related business. So it occurred to me that it is nearly the end of the month and definitely time for a quick check-in. One such activity is the boatbuild, and while I can’t take any credit for actually making her, I did spend the day recently with Jamie and Emily down in Exmouth. If ever you would like a boat building, then these are your guys – they are brilliant in every way and come with sparkly recommendations. 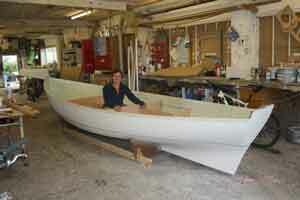 She should be finished by the end of July, so I am sourcing fixtures and fittings and smiling sweetly at companies asking to them to sponsor me – it’s going well so far and I am pleased to say that MarineTrack, AVMarine, Barden and Jordans Series Drogues have all agreed to come onboard.